Ransboro National School provides for a wide variety of sporting activities for the pupils in our school. We have been fortunate to have very close links with our sporting local community and have derived great benefit from our close links with our local Coolera/Strandhill GAA Club, who provide excellent training locally for many of our pupils. 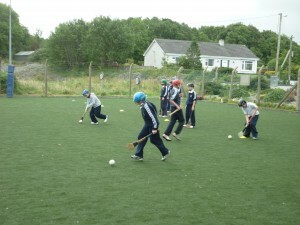 For the past few years, a popular sporting activity in the school has been the school GAA leagues organised by a member of staff. The league takes place in the spring term and pupils from third to sixth classes make up the teams. Matches are played at lunchtimes culminating in a grand final. We also have to thank many of our parents, who have provided huge support to our school teams while entering Cumann na mBunscol competitions. We have had much success in recent years winning hurling competitions and reaching final stages in hurling and football competitions. We have developed close links also with Youth Sport West and Sligo Sport and Recreation Partnership and have been fortunate enough to provide a wide variety of extra-curricular sports activities in the form of golf, tennis, basketball, volleyball to name but a few. 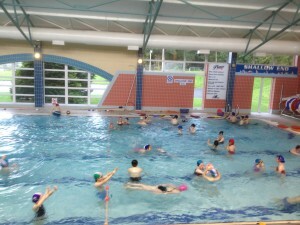 All pupils from 2nd to 6th classes access a block of well structured swimming lessons in Sligo Regional Sports Complex. It is wonderful to watch children progress at their swimming skill over their senior years in our school. We hold an annual Sports Day, where children have the opportunity to take part in a wide range of fun sports, from obstacle races to sack races! Children also take part in weekly P.E classes with their teacher and throughout the year, we are fortunate to be provided with excellent coaches for football and hurling from Sligo GAA and IT Sligo. We also take part in football and hurling blitzes, soccer competitions, the annual Athletics Fest in IT Sligo, and have been fortunate in recent years to have been offered a tennis “taster” day for all classes and some years we are offered coaching with a rugby coach. Thank you to all who have been involved in assisting in the sporting activities in our school over the years! This stop-motion video show sixth class doing hurling skills training in the school hall.